Now that Mardi Gras is over and for us Catholics and members of other denominations that observe Lent typically we give something up during the weeks before Easter. Moreover, in doing so we have selected to give up coffee and all red meats for the season of Lent, but look forward to eating much more seafood, and plenty of the bounty of the sea. For the 40 days of the reflective, penitential season, it also can mean a season of giving to others. That is an idea that can extend beyond people of faith, to the betterment of our community. That might mean spending time in community or charitable work that serves vulnerable members of the community such as children, the sick or the elderly. Giving also means more than just opening up your pocket book, but can equate to giving of your time. Volunteering at the local food bank, charity organizations, or other non-profits that serve the community go much farther to helping the community. It also builds self-esteem knowing that you helped someone else have a better day. Locally, we have donated time in volunteering at local Catholic charities, food pantries and childcare giving. Globally, we donate money to several charity organizations throughout the year, in addition, I participate in the BloggerAid Changing the Face of Famine, bloggers making a difference. Back to food…what kind of seafood is available fresh this time of year, well, we still have oysters, shrimp and crabmeat, though still quite expensive, and if you are willing to shell out $12.00 a pound for fresh Louisiana crawfish tails you can get them too. Marcelle Bienvenu who writes in her article “It’s still too early for crawfish, but other Lenten choices abound” found in the Times-Picayune, the New Orleans newspaper and NOLA.com online, she reports that crawfishermen are bringing in really small catches right now, but warming temperatures in the next few months will have them increasing in numbers. Today’s Lenten choice recipe is a quick and easy dish of sweet and spicy shrimp, inspired by the Weight Watchers recipe from page 32 in the cookbook, “Five ingredient, 15 minute recipes.” This recipe has a Weight Watchers point’s value of 7, and nutritional analysis is 322 calories, 4.7g fat, 28.3g protein, 39.6g carbohydrates, 0.4g fiber, 194g cholesterol, 392mg sodium, 78mg calcium. 1. Combine the cleaned shrimp with the Cajun spice blend and reserve. 2. Combine the orange juice and apricot preserves in a small saucepan and heat until the preserves are melted into the orange juice, continue to simmer until slightly thickened. 3. Heat the olive oil in a very hot sauté pan over high heat and add the shrimp. Sauté the shrimp evenly on all sides until almost pink, then add the orange juice mixture to the shrimp. Heat through until shrimp are pink, but not over cooked. 4. 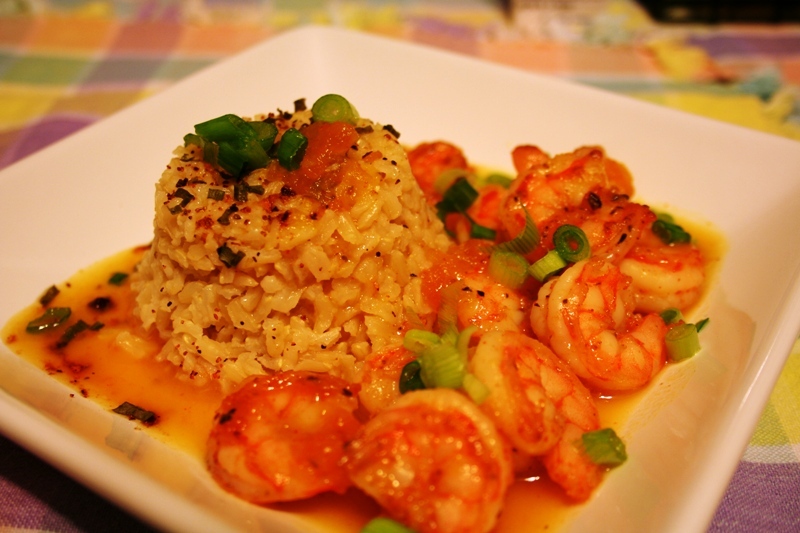 Serve each portion with ½ cup of cooked rice and 3/4 cup of the shrimp and sauce. Garnish with the green onions. While I don’t observe Lent, I definitely appreciate the helping others and volunteering aspect. That’s something we should all strive to remember and act upon, and it’s good to be reminded of that. And, well, of course I do not need a reason to make shrimp – that’s always welcome on my table. This sweet and spicy dish looks great – Cajun seasoning with that orange/apricot sauce, yowsa yum yum. That’s such a beautiful shrimp dish…my favourite. Beautiful presentation. I do not observe lent but I grew up in a catholic family and I know how hard is it to give up red meat for lent! This is such delicious dish to have while not having red meat during lenten season. I plan on being a shrimp-eating fiend this Lenten season. Thanks for the recipe! The sweet & spicy flavor combination sounds fantastic here! Sounds just perfect for our dinner tonight! I love anything sweet and spicy! This sounds so good! these are perfect love the sweetness in the apricot, as I love it on salmon never thought to do that with Shrimp sounds terrific! Apricots in savory food is so good together when done right. I can certain see this working in this dish. Lovely recipe for the weekend. I love shrimp! The apricot preserves are an interesting addition here. I’m always surprised by the flavors of creole cuisine. I love the idea of it all. This sweet and sour shrimps sure is mouth-watering!